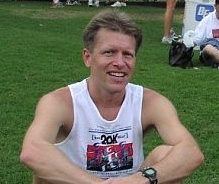 – Running background: Competitive runner since 1974, but have been running all my life. Was unanimously voted “fastest runner” in Little League baseball, so I have always had the ability to run fast. I have been a running coach since 1981 and love talking to people about running and helping them to meet their fitness goals. – Best piece of fitness advice: Use It or Lose It. As we age, it takes longer to get back in shape. It is always easier to stay in shape. – What inspires or motivates you to exercise everyday? I ran everyday for 13 years and 2 months, so I know it is possible to plan fitness into your everyday life. Even a life that includes travel, family, living in multiple cities, there are no excuses to exercise, just many more reasons to exercise. I exercise for lots of reasons: stress reduction, improved physical and mental health, weight control, anti-aging, and a sense of togetherness with others who exercise. – What inspires you to lead a life of fitness? Regular exercise is beneficial for the whole body and mind. I am rarely sick. I can still wear the same size clothes as in high school and that was over 30 years ago. Even with a family history of genetic related diseases, fitness has kept all of them at bay. Awesome! Can we spread the word yet, or is it still in beta?